Alice is half girl half cat. Like all of my dolls, she is one of a kind. Her face has been sculpted from clay and painted with acrylic paints. I have given her a realistic skin texture with matte varnish, and shiny lips and eyes with gloss varnish. I have used blue Lauscha glass eyes, which I believe are the best. 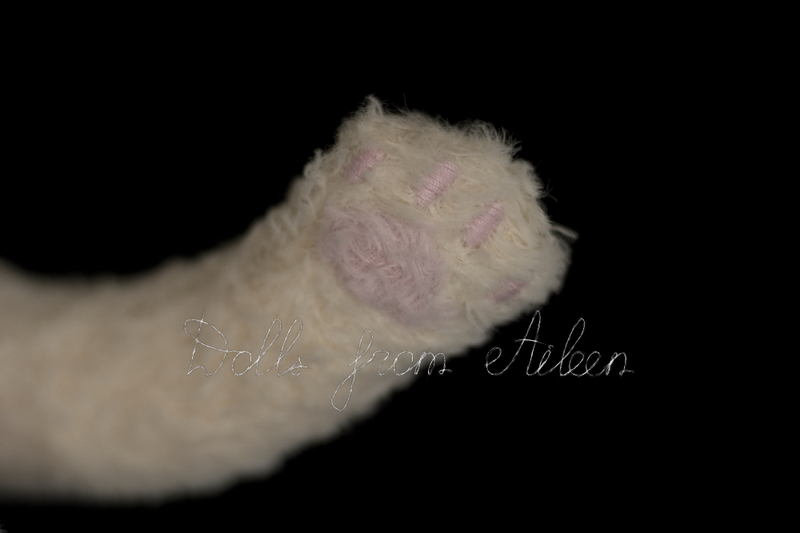 Her 'fur' is viscose, in a gentle cream and baby pink. Her blonde hair is synthetic. I have made a wire armature and used glass beads in the legs so that Alice can stand. The neck has a cotter pin joint which allows it to be turned. The limbs are fixed in their position without any joints to move them. Alice is stuffed with Fiberfill. She is 30cm tall. To complete Alice's look I have given her a pink ribbon and Swarovski heart. Her paws are realistic. She is beautiful and fabulous. Please note: my artworks are not intended for children.